A few days ago, I bought a Keithley 197 sold as “unknown working condition” on the cheap. The seller said that some of the keys on the meter were unresponsive. I figured that I’d try fixing it if I could. After all, these 5 ½ meters still fetch well over $100 on eBay and for a fraction of that price, I was willing to give it a shot. After the meter arrived, I did a quick sanity check and everything appeared to be working fine except for those four silicone rubber momentary buttons on the left. The meter itself was well within spec as you can see from the picture shown below using the HP6113A 5V output as a reference. The HP6113A’s output was reasonably accurate (measured 4.9995 on my Keithley 196). As to why these silicone rubber buttons are not working, I think I have a pretty good idea. 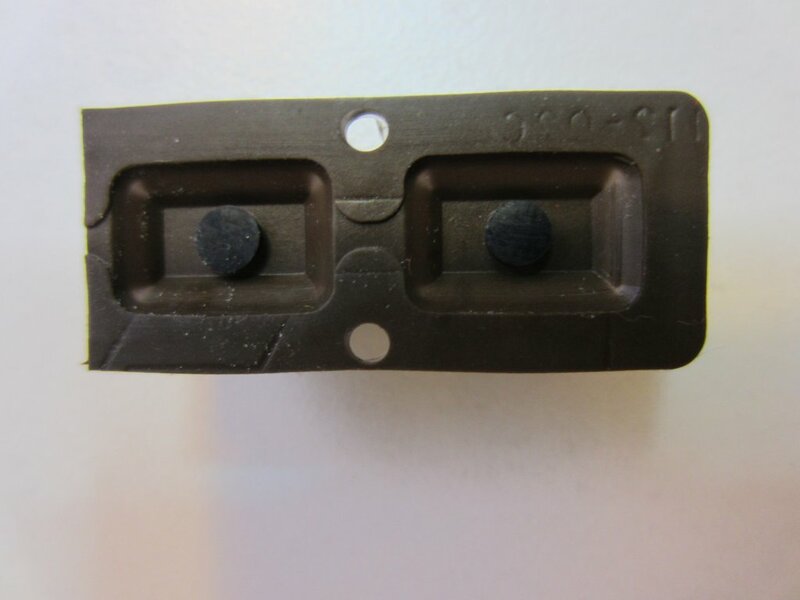 These silicone rubber switches are notorious known for their poor reliability especially when the equipment is left unused for a long period of time in high humidity environment. The contacts of these switches could easily get oxidized and become non-conductive. Below are a picture of the bottom side of the Keithley 197 and a closeup of the silicone rubber buttons on the front panel. 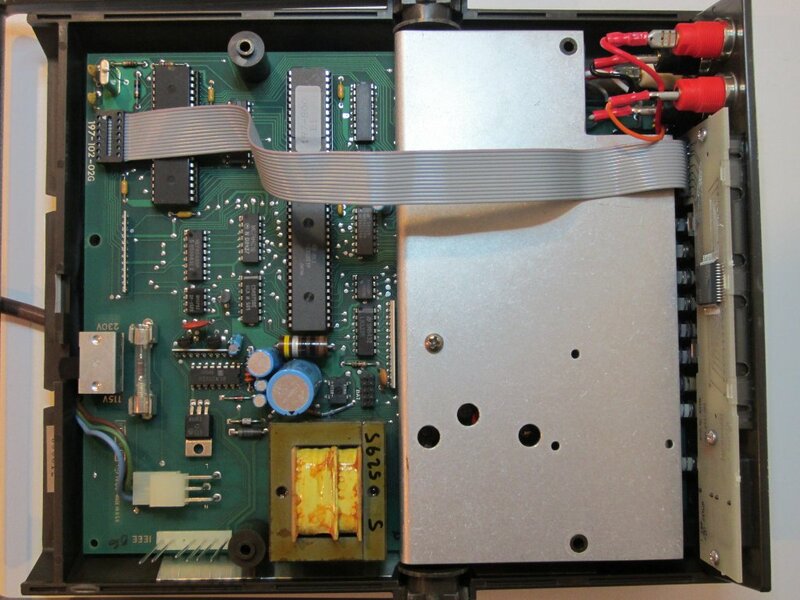 But before I go fixing these contacts, let us take a thorough look at what’s inside the Keithley 197. 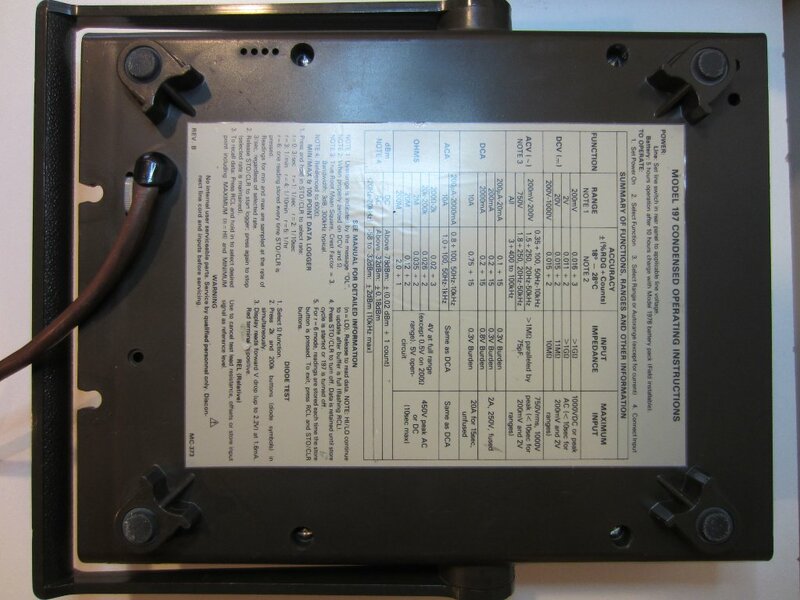 The top cover of the 197 can be removed after loosening the four screws located on the bottom side of the case. The picture on the left below is what you see when the top cover is removed. The analog circuit portion is shielded by a thick aluminum cover which is held onto the chassis via two standoffs and a screw. 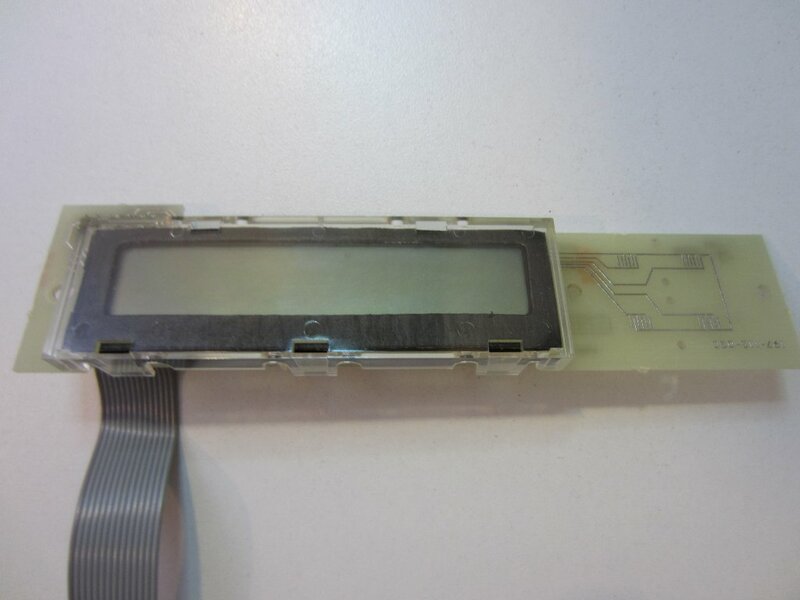 After taking off the shield and disconnecting the ribbon cable from the display board, the main board slides out easily. 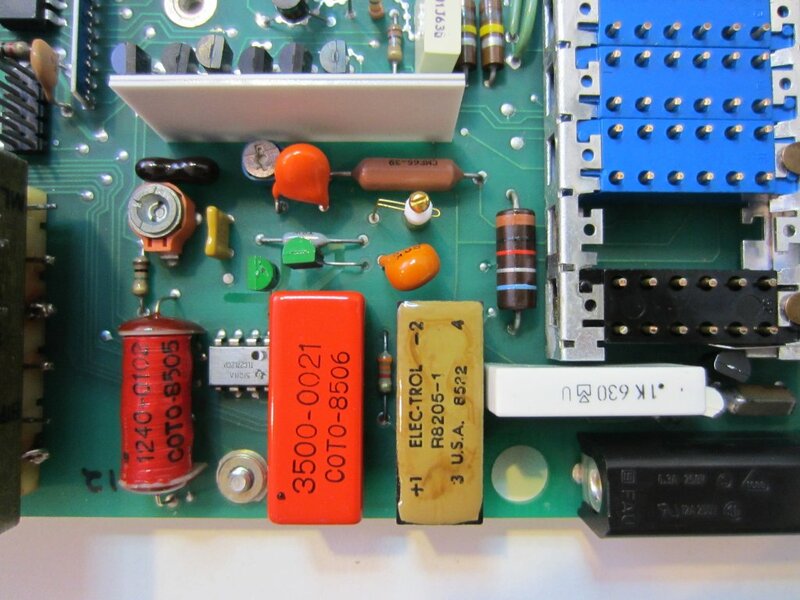 As you can see from the picture below, the entire bottom side of the circuit board is also shielded and connected to the main board’s ground via a metal tap on the board. 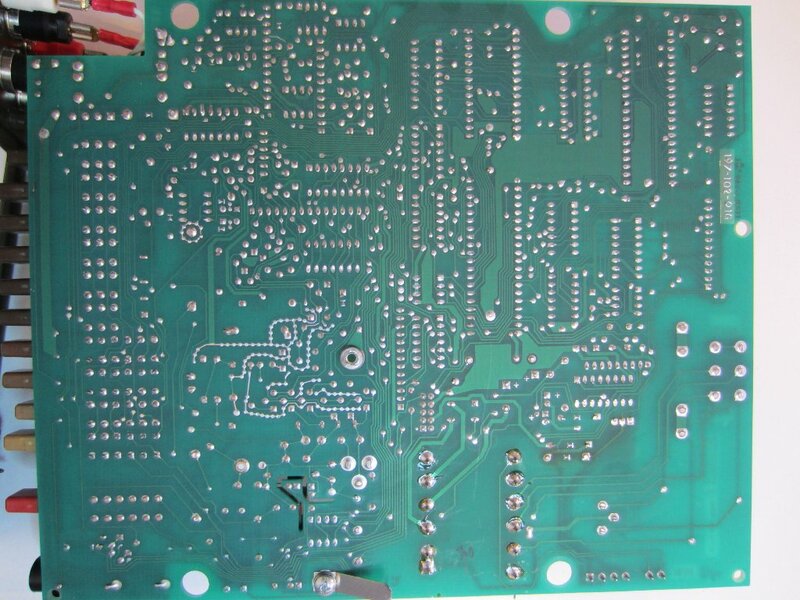 Here are two pictures showing the top side and the bottom side of the main PCB after it was taken out of the case. Note the guard traces in the high impedance JFET front-end circuit section. Below are two close-up pictures of the analog front-end. On the left side, the three larger vertical components towards the bottom are three relays (marked as K101, K102 and K103 on the circuit diagram) which are responsible for auto ranging and mode switching. The picture to the right is a closeup of the high impedance section. 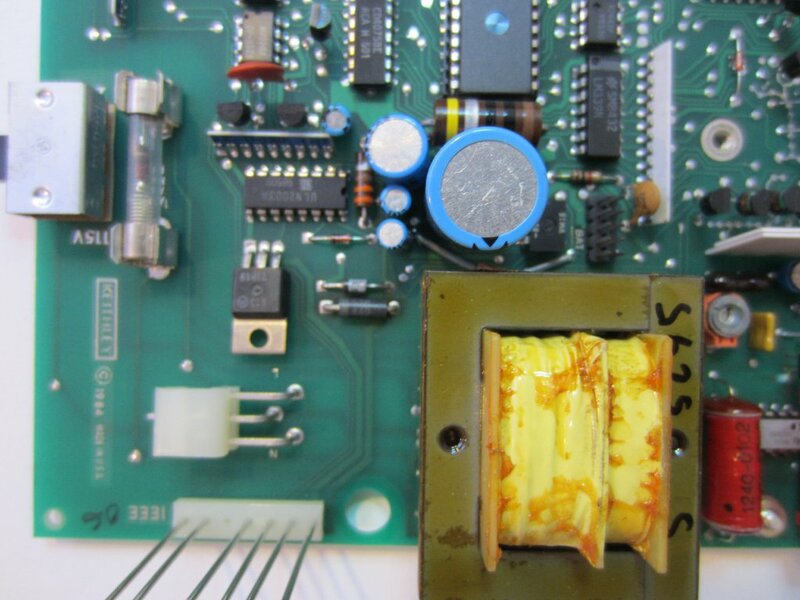 The picture on the left below shows the remainder of the analog side circuit. 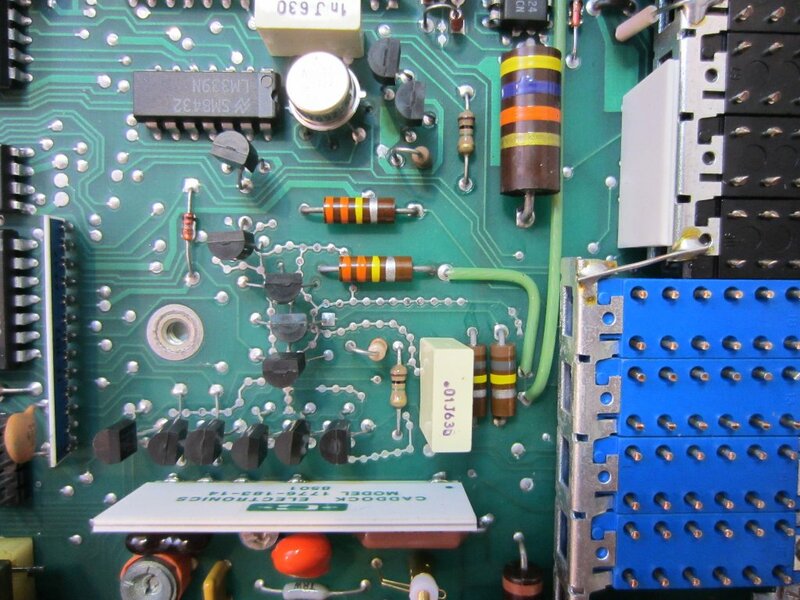 In this picture, you can see the precision RMS-DC converter chip AD637 and a bunch of precision low drift OpAmps. 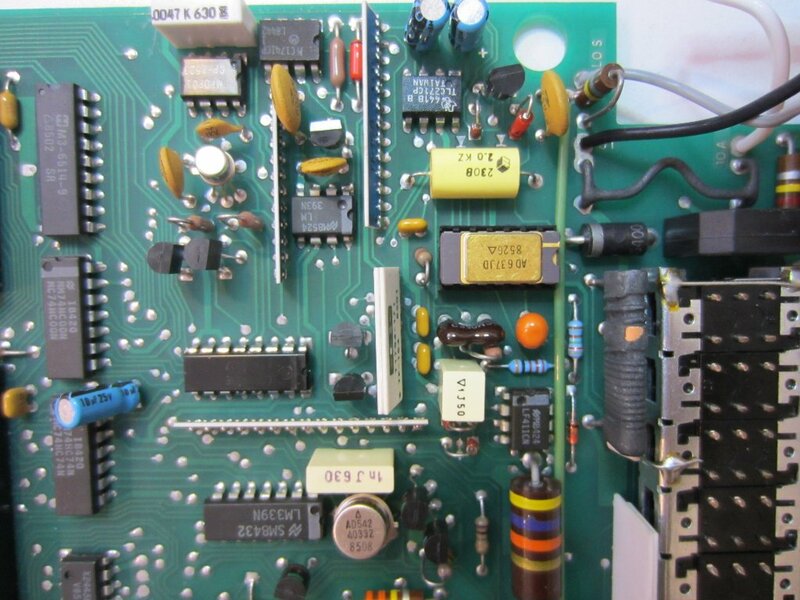 The picture on the right is the power supply section of the board. The following two pictures are the digital circuit portion. 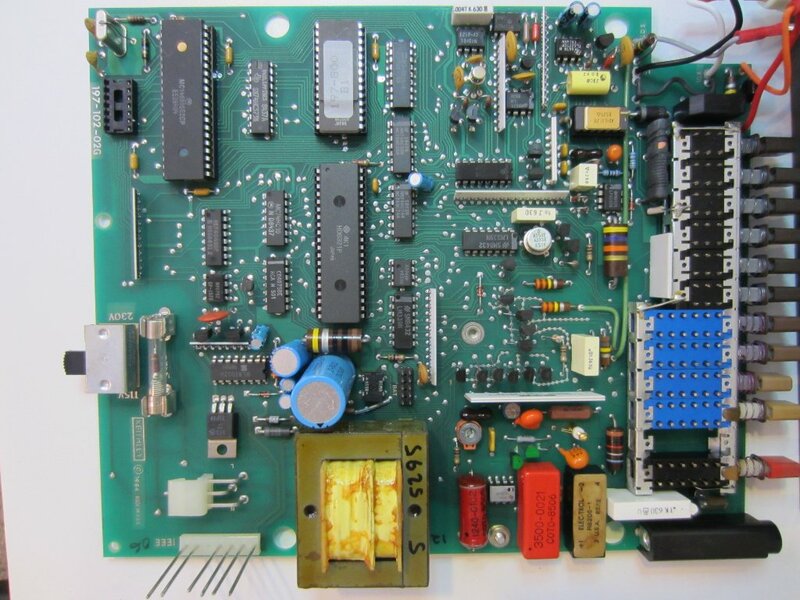 The main MCU is MC146805E2, a Motorola 6800 series microprocessor. 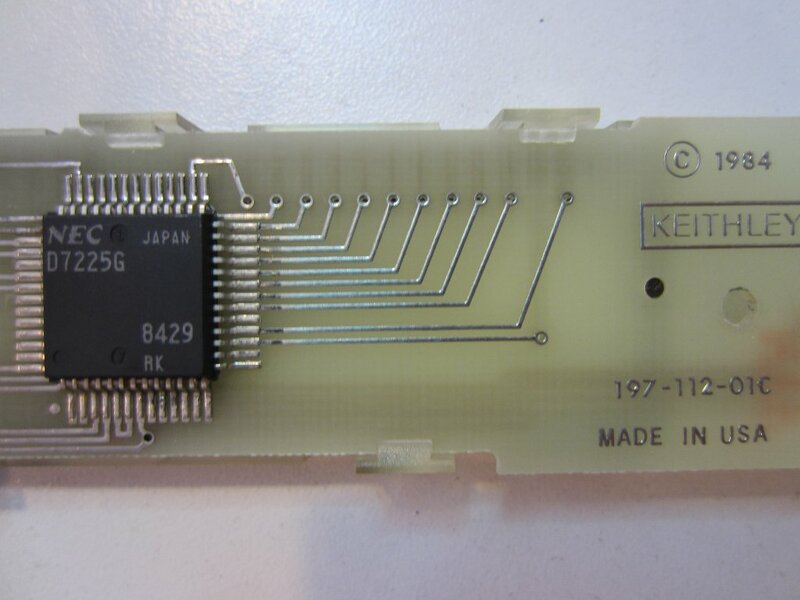 The firmware is stored in the 2764 EPROM (64 kbits). The other larger chip (HD6321) is a Peripheral Interface Adapter (PIA) that is used in tandem with the microprocessor. Unlike the range-switching piano buttons, which are mounted directly on the main board, the silicone rubber button contacts are etched directly onto the vertical board where the LCD is mounted. 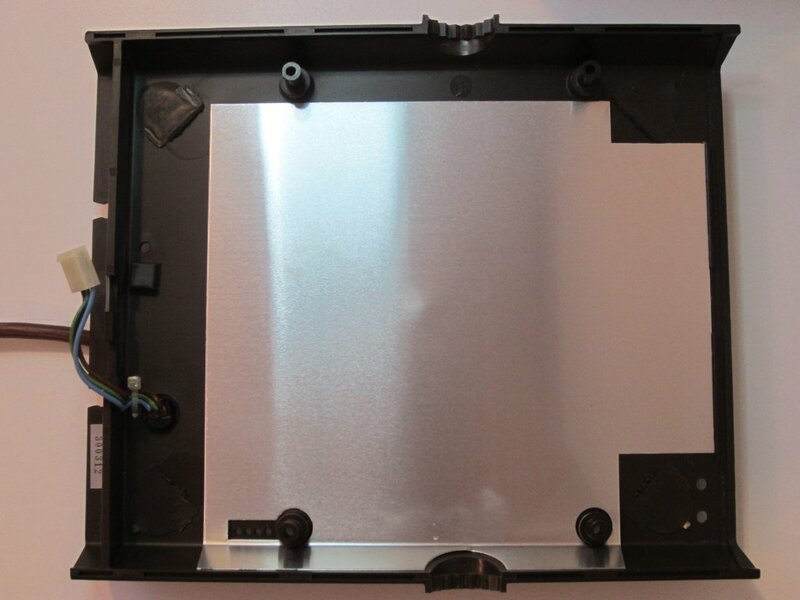 The LCD board is held onto the front panel via three screws. After removing the LCD board, it became pretty obvious that the button contacts need some cleaning as the surface was clearly oxidized. And the conductive surface of these silicone rubber buttons are also caked with dust. Their restoration is pretty simple. The board and the contact surface were first lightly sanded and then treated with isopropyl alcohol. After cleaning, these four momentary buttons worked perfectly. Compared to the 6 ½ Keithley 196, the main sacrifice you will notice is the resolution in the DC and resistance measuring ranges as Keithley 197 has 5 ½ resolution across the board whereas for the 196, these ranges are 6 ½. But for the other measurements (e.g. 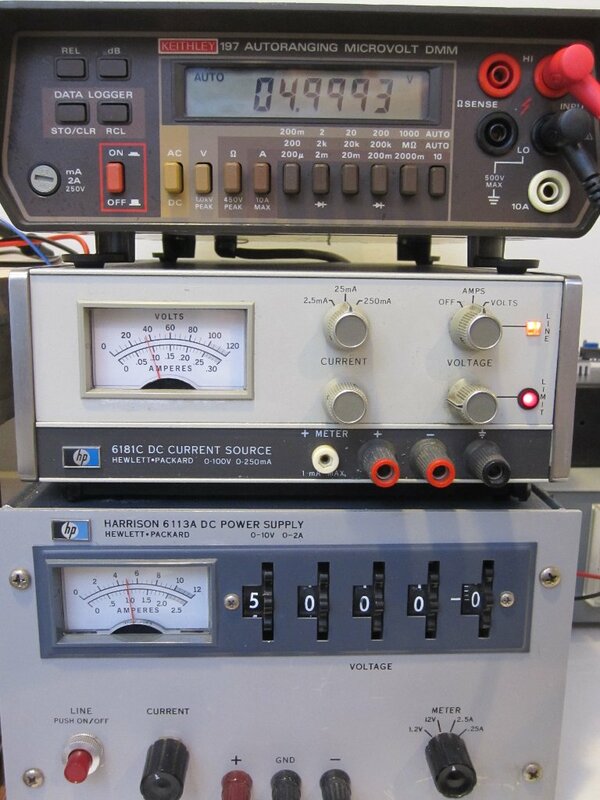 AC voltage or DC/AC current) both meters have similar 5 ½ resolutions. Of course, Keithley 196 is still more accurate in the other ranges as it has a maximum count of 303,000 (at 5 ½) whereas 197 has a maximum count of 220,000. Another area Keithley 197 lacks is the display update rate. Keithley 197 refreshes its readings roughly 3 times per second, which is at least 4 to 5 times slower than 196 in its highest resolution mode. And Keithley 196 can operate at much higher speed at lower resolutions (maximum 1000 readings per second). 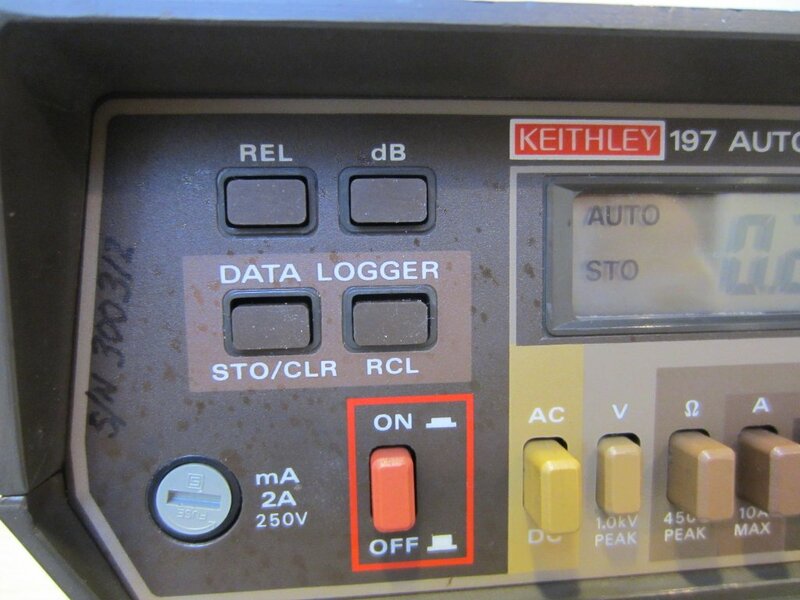 Still, Keithley 197 was a pretty decent meter back in its days and still is even by today’s standards. Dear Kerry! In Your article there is a paragraph:”On the left side, three large vertical component in the direction of the lower part are three relays (marked as K101, K102 and K103 on the concept), which is responsible for auto-tuning and switch. “I’m interested in the chip, DIP8 between them.Marking :719 BN SN103152P manufactured by Texas instruments. In my Keithley 197 this chip is out of order. On the official website of the company I didn’t find Datasheet for this chip or its equivalent. On sale it is also no. Can You please help me in searching for a site or equivalent of this chip? Hmm, where did you see 719 BN SN103152P? 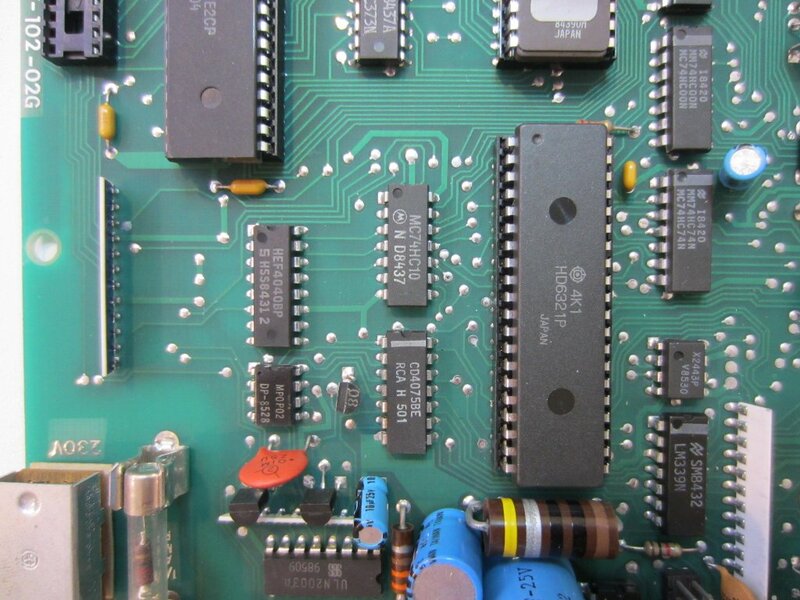 In the picture, that silver 8pin IC is labeled TLC27L2, which is a dual op-amp. I have repaired many elastomer type keypads using Neo-Lube No.2 available from Micro-Mark and may be available from a hobby shop in your area as the model train builders use it. A bottle will last you probably decades! I just brush on a few coats (dry between coats) onto the carbon buttons. Thanks for the tip Sam! 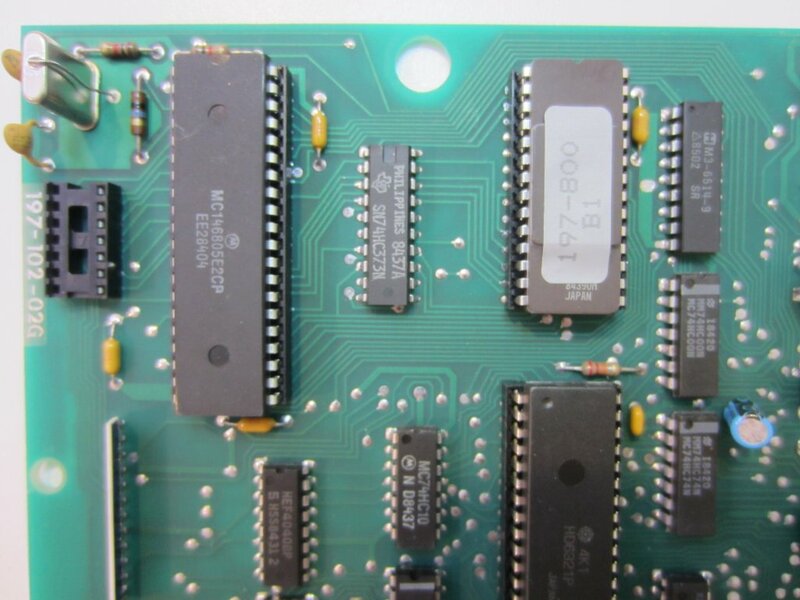 I have the EPROM with the C2 firmware EPROM (197-800). Is someone interested in the .bin? Hi Eric, if you want, you can send it to me and I can post it on the site. Uploaded (towards the end). Thanks!